Mountain bike computers are much better than having to pull your mobile phone for tracking data with apps. Your battery dies or the app turns off in your pocket, meaning you have lost your hard earned data. Deciding on the right mountain bike computer for you will come down to price. Distance/speed only bike computers can be bought for under $50. Once you start wanting GPS maps and heart monitors, you can pay up to $500. We have split our reviews into GPS and non-GPS bike computers to make your decision a bit easier. Garmin has been making GPS tracking devices for automobiles and boats (SATNAVS) for years, so you know this will be decent quality. Garmin are the leading manufacturer in GPS tracking devices and have amazing map technology. But quality comes at a price…you could buy a decent mountain bike for this price of this device! This mountain bike computer comes with all the standard distance/speed tracking functions, but it also has a heart monitor, a virtual racer and built in maps. Once you have tracked your ride, you simply upload the data to your PC to keep a log of your performance. The Garmin Edge 800 comes with Garmin Basecamp, this is desktop software that allows you to create your own dedicated maps for mountain bike routes, then transfer them to the Edge 800. 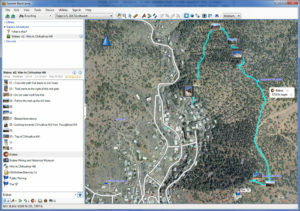 You can also use Garmin Connect, which allows you to for thousands of routes uploaded by other users. For endurance mountain bike riders, the Edge 800 comes with ANT+ which allows you to sycn your health stats with your 3rd party monitoring software. Garmin’s Edge 520 MTB computer is a much cheaper model than the edge 800 above. The edge 520 does not have the heart monitor and maps, which we don’t think you really need. The Edge 520 is also fully compatible with Strava, which gives you a load of live analytics – you also get a 2 month free trial of premium. These MTB computers also sync with ANT+ trainers, read Garmin’s full spec here to find out more. The Edge 520 also has 15 hour battery life for those MTBRs looking for an all day adventure. Cyclo 315hc includes a heart rate monitor and speed/cadence sensor. Rugged and water resistant (IPX-7) to take on any terrain; all have a user-friendly interface in a 3" color swipe anywhere touchscreen with large control buttons for gloved hands. Complete USA road network for audible and turn by turn navigation and Open Street Maps (OSM) crowd source trail data displaying cycle lanes, cycle tracks and bike shop POIs. Discover new cycle routes and bike trails or record and share your own. Custom cycling profiles (up to 6) can be created to show routes specifically designed for your riding equipment, style and sensors attached. For mountain biking profiles the routes suggested will even show what % of the route is on dirt vs. paved roads. Input distance or time and Cyclo will provide up to 3 routes for a rider to select. Each route shows elevation gain and difficulty. In a new city or just want to try something new Cyclo's Surprise Me is perfect for any rider looking for a graded loop. 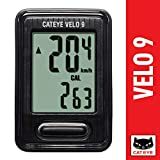 A decent alternative to the Garmin bike computers and a lot cheaper, but still is GPS enabled. Like the Garmins they also work with 130+ ANT+ sensors and also runs Open Street Maps (OSM). The Magellan also includes a heart monitor and speed/cadence sensor. We love the large buttons on the mountain bike computer which makes for easy control and viewing when you are wearing gloves. Rider reviews have stated that the battery can easily last 8 hours. 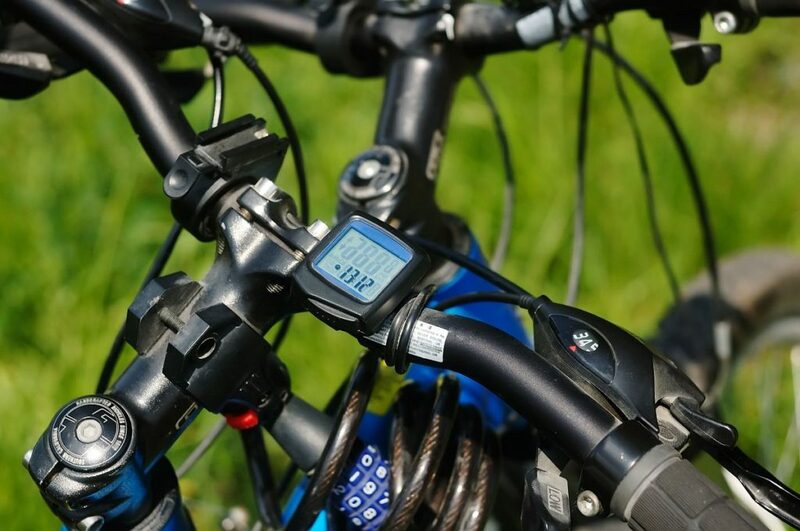 Note: These mountain bike computers will not have GPS, cadence monitors or heart rate monitors. 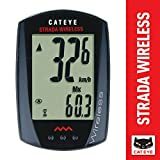 The Cateye Strada is the best selling mountain bike computer on Amazon, with over 1000 positive reviews and under $50. The Strada has all the basic features like speed, distance and a clock – but also has a handy feature of stopping time recording when you take a break. The screen and navigation menus are very easy to use, even with mountain bike gloves on. This bike commuter is also water resistant and easy to mount on your handlebars (all brackets included). The computer is also compact with a total length of 2″ and 1.25″ wide. This is one of the best selling mountain bike computers on Amazon as it has great functionality and half the price of top brands. The computer will fit on any type of handle bars and runs on batteries. Total weight is only 30g. Hatip to Limon over at http://www.mountainbikeslab.com/ for this one, he gave us one of his to test out. 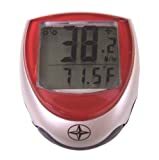 Another top rated seller on Amazon by Cateye. Similar function to above and also counts calories burnt per ride. Another low-cost option with 20 different functions. Schwinn also has some of the top selling and rated mountain bikes on Amazon so this is worth checking out.